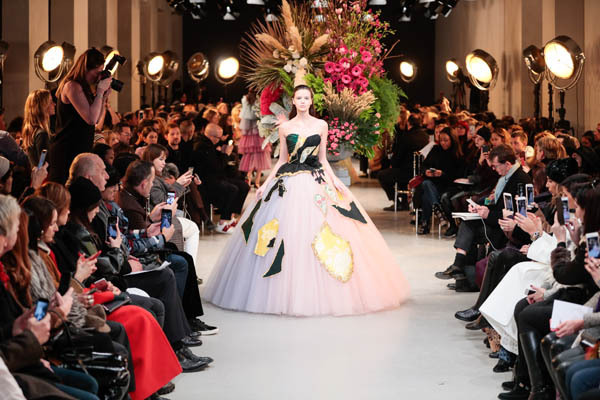 Viktor&Rolf Haute Couture Spring/Summer 2017 highlights an ongoing interest in the imaginative upcycling of existing elements. This season marks an evolution from Autumn/Winter 2016 when materials from past Viktor&Rolf collections were used as a basis to create a stepping stone for the new. For Haute Couture Spring/Summer 2017, fashion artists Viktor Horsting and Rolf Snoeren continue to delve deeper into their search for “conscious design”, utilising vintage cocktail- and eveningwear from various decades as their base material. Existing dresses – oftentimes damaged, with visible signs of wear, are taken apart. Their fragments are pieced back together as surreal collages, restoring their components into new ensembles with unexpected shapes. Repairs are accentuated with gold according to Kintsugi, a principle of Japanese pottery in which beauty arises from imperfection. The focus is placed on finding value in missing pieces, cracks and chips – bringing to light the scars that come from life experiences. Acknowledging the beauty of imperfection is a positive reinforcement which ultimately renders the original into something more beautiful and more valuable, essentially transforming the imperfect into a thing of beauty. A multicolour degrade palette of faint primary colours and light pastels is enhanced with burgundy, raspberry and green. The silhouette, characterised by asymmetrical shapes, is light and airy, featuring garments that are both moulded onto the body and voluminous. This season´s Haute Couture look is accentuated with Christian Louboutin shoes customised for the occasion. Directly after the show, three creations are available for direct purchase on the Viktor&Rolf Concept Store.